When listing all of the skills and traits that make up a good nurse, the ability to communicate well is sometimes overlooked. Of course, like many other occupations that involve working closely with people, it makes sense that this “soft skill” would matter. But when it comes to working in healthcare, good communication has the power to substantially affect patient outcomes. This is true not only for communication between nurses and physicians, but also with patients. Here are four things top nurses do to communicate more effectively. 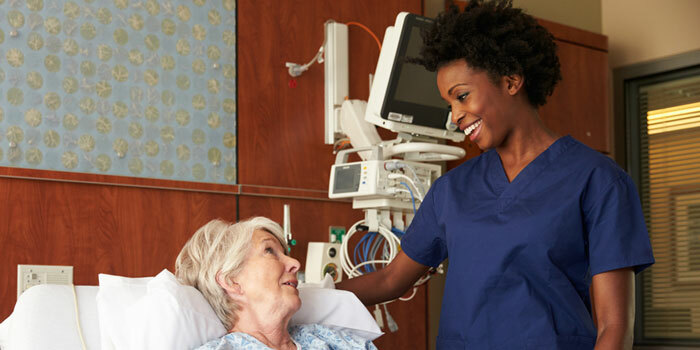 Nurses are the ones who are most often at the bedside of patients. Through good communication, nurses can assure patients and put them at ease, make them feel empowered, help them better understand their health issues, give them an opening to fully voice their concerns, and motivate them to listen and follow their medical regimens. In fact, studies have shown that good communication can have a therapeutic effect on patients. In short, making a personal connection with patients should be just as important as your other more tactical duties as a nurse. Healthcare professionals are busy people, to say the least. These roles also require a lot of collaboration among interdisciplinary teams. Nurses need to make the most of their communication with fellow nurses and doctors to make sure that patients receive the best possible care. If you have several questions about a patient’s needs, consolidate them into one phone call, email or conversation to make the most of your time. If an intervention isn’t working, come into the conversation with a potential solution so a decision can be made more easily. When you’re working in healthcare, difficult conversations come with the territory. Whether you’re talking to a colleague or a patient, it’s important to be aware of your body language to make sure it is in alignment with the message you are delivering. This is key in all conversations, from keeping a patient calm to asserting yourself with someone on your team. More than anything, people want to be heard. To communicate well with others, you need to make sure that you are hearing and processing what they are saying back to you as well. Being a good listener can help nurses connect with patients and catch details that might otherwise fall by the wayside, and build stronger, more collaborative working relationships with other nurses and doctors.